You are in for a sweet treat. 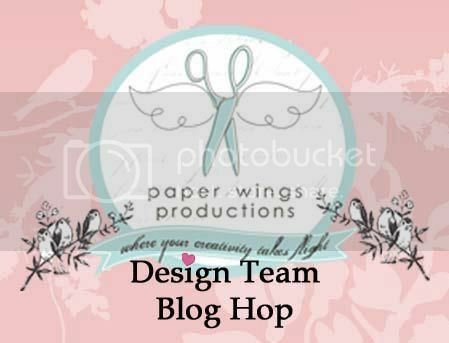 Today is February's Paper Wings Productions Design Team Blog Hop and we are celebrating love of course! If you are here from Amber's blog then you are in just the right place. If you lost your way start at The Aviary where one lucky follower will win this fabulous blog candy and the chance to be featured as a guest designer in a future hop!!! BONUS: For extra chances to win, just like the Paper Wings Productions Facebook page and/or invite your friends to the hop. Then just come back and let us know! Be sure to leave a separate comment for each of the additional entries. The winner will be announced on Tuesday, February 5th on The Aviary. Since you already have stopped off at many of the design team member's blogs you know how talented they all are and it is an honor to be featured amongst them. I thought about what would make my home feel loved and I came up with a little love banner. I chose the colors of raspberry, white, aqua, denim blue, chocolate brown and gold. I designed the whole banner around the gorgeous elaborate frame from the Dia De Los Muertos Mujer stamp set. 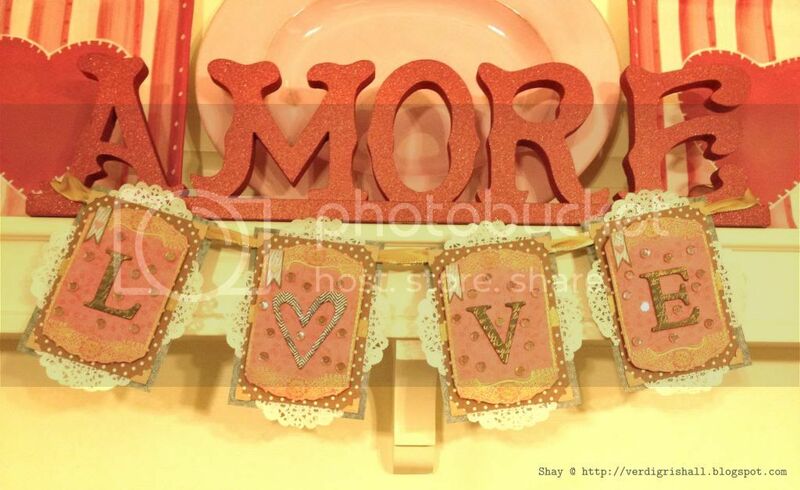 I went all out girlie with this project...pink, hearts, gold, doilies and sequins to name a few feminine touches. I know this picture isn't very detailed (and the color is just a wee bit off)...don't worry you can see each panel better if you keep on reading. I embossed the frame 4 times with gold embossing powder (it is so lovely in gold) onto a piece of raspberry pink patterned paper. These pink panels were adhered with foam adhesive to a brown polka dot panel that has a strip of gold washi on them and kraft photo corners on each corner. Under the brown panel are halves of doilies placed on each side. I adhered my brown panels to blue panels. I punched a hole in the top left and right corners of the blue panels to weave my gold ribbon through. To decorate each of the pink panels I added a chipboard letter I embossed in gold using the handwriting from Writings Backgrounds or Writing and then I inked the letters with brown ink and sprayed them with mist in a blue for a cool resist. The heart already has a resist pattern on it so I simply sprayed it with the same mist and then inked edges with brown. I adhered the letters and heart (happily they all already had adhesive on them) to their respective pink panels. I then stamped in brown ink the double sided banner twice from Tabs and Banners onto blue striped patterned paper and cut each in half, inking the edges with brown ink. 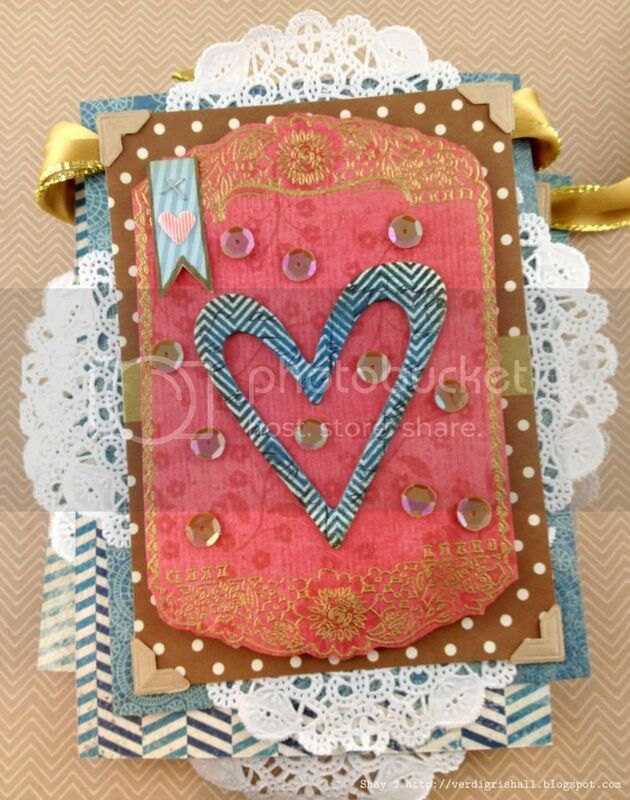 I added each piece of the banner with my Tiny Attacher to the pink panel and finished it off with a heart sticker. My last bit of embellishment was to add a sprinkle of iridescent brown sequins (using mini glue dots made this easy). See what I mean about that gold embossed frame from the Dia De Los Muertos Mujer stamp set? Stunning! And there you have it, a very pretty banner to add to your home decor this Valentine's Day or to gift to a friend or family member. Make sure to head on over to Carrie's blog next! Thank you so much for joining me today and I hope your day is full of love! Wow! Loving the banners on the hop today. You are so talented! You an definitely see all the hard work you put into this- it is fabulous! Morning Shay! Boy we were on the same way length, huh :D Love you banner with all of the beautiful "girly" details you added and the touch of blue looks gorgeous too! Happy February my friend!!! WOW! This is gorgeous! The colors are sooo pretty! I am a new follower and hope you will visit my blog and become a follower too! Beautiful banner! I LOVE the gold embossing! Thanks for the inspiration Shay! This banner is amazing! TFS! So beautiful! I love that you used the frame from the Mujer set! Such a creative way to use that image. Thanks Shay! wow, I love the frilly parts to your banne. just love the lace and bling is a girls best friend. thank you for sharing your pretty with us. Ohh...super cute! 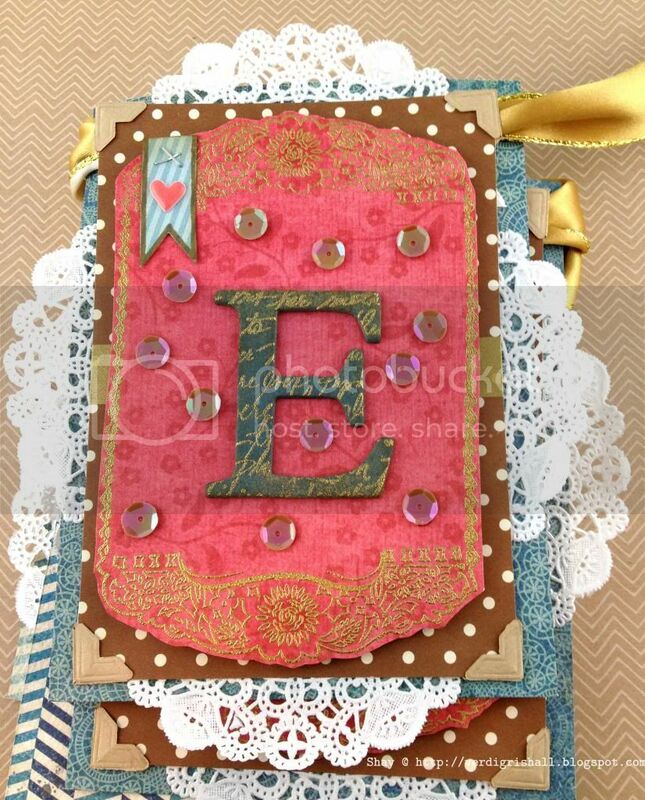 Love the colors and the gold stamping you added to the letters is fabulous! Shay, this is gorgeous! Love the frame you used with the gold. What a lovely banner, Shay. I love the gold embossing around each label. I think my New Year's resolution should have been to use more embossing and glitter in my work. It's so beautiful, and I have enough supplies! (I never remember to use) Thanks for the inspiration! Beautiful banner! I love the photo corners & the sequins! wow this is a gorgeous banner! 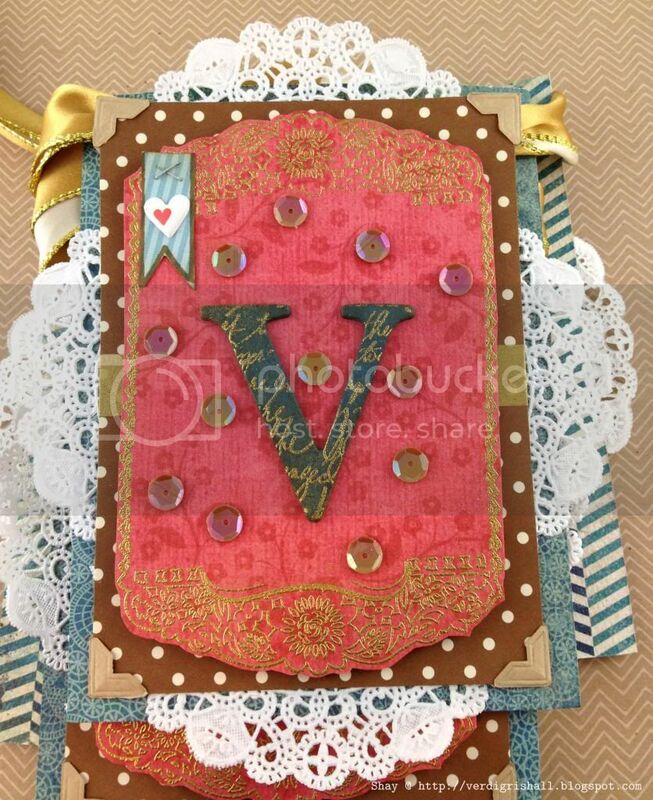 I love the paper colors and the doilies! Just gorgeous! That gold embossing adds such an elegant touch! Fabulous banner! 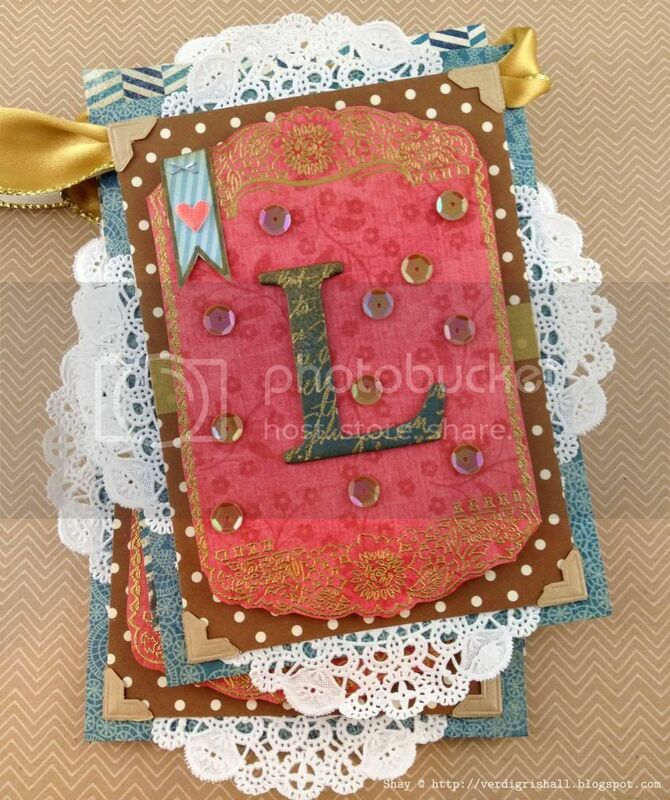 I love the gold embossed frame around the letters - I never would have though to use that stamp in this way. I love it and will try!